Like many ancient festivals, Samhain continued with the coming of Christianity. November 1st was henceforth to be All Saints Day. The night before was Eve of All Saints Day, or the Eve of All Hallows. But while the name might have changed, old habits persisted. Halloween was a time when witches and warlocks might walk abroad, engaged in wicked practices. In many parts of Scotland it was customary to leave an empty chair and a plate of food for invisible guests. People believed that it was the night when the souls of the dead were set free to roam. They might come into their houses and eat at their tables. The hour before midnight was the witching hour when the departed returned. Silence was marked as the chimes of midnight rang out. Its not hard to understand why, in Scotland of all places, Halloween continued to be important. Much of the nations history involves the supernatural. From the witches of Macbeth as imagined by William Shakespeare to the real burning of women, accused of working with the devil, in a rash of satanic trials during the seventeenth century. There is a special atmosphere in many parts of Scotland even to this day where, as daylight fades, the flames of Halloween bonfires show up ancient ramparts of castles and buildings where devilish deeds once may have been done. Robert Burns, Scotlands greatest bard, wrote extensively of how ancient beliefs had survived well into the Christian era, as he twisted stories of witchcraft and the devil with the traditions kept alive during Halloween. What is remarkable is how so much of the pagan past persists to this day. Bonfires, which once were lit to scare away the undead, still illuminate the October sky. Lanterns, which in Scotland were always carved out of turnips, are fashioned for the same purpose. Until recently trick or treat was unknown in Scotland. Instead children here dressed up in old clothes, or pretended to be evil spirits and went guising. The custom traces back to a time when it was thought that by disguising children in this way they would blend in with the spirits that went abroad that night. Any such child who approached a house would be given an offering to ward off evil. These days children who knock on their neighbours doors have to sing for their supper. Or tell stories for a gift of sweets or money. Childrens parties are still an important element of Halloween. One of the most popular games in Scotland is dookin’ for apples, where bairns (children) have their hands tied behind their backs and try and grab apples from a basin full of water. Apple dookin usually follows on from the game of treacle scones. Here again the hands of the children are tied, and sometimes they are also blindfolded. Participants are invited to bite a scone, covered in treacle, hanging from a rope. Messy faces are usually then washed in the apple basin! As part of the Tweed Valley Forest Festival in November 2008, the town of Peebles set the world record for the most amount of people to dook for apples at one time. Amongst the 70-strong participants was a local MP and a councillor. The modern world has had an effect on some of these customs. Pumpkins are now as common as turnips for lanterns. Children turn up shouting trick or treat and expect gifts without having to perform, and traditional songs and games are dying out in some areas. 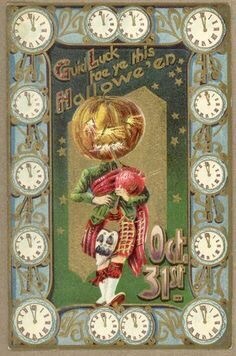 But there is still sufficient spookiness in old Scotland to ensure that the Halloween rituals will be as everlasting as the spirits that are said to return to earth when dusk arrives on October 31st.